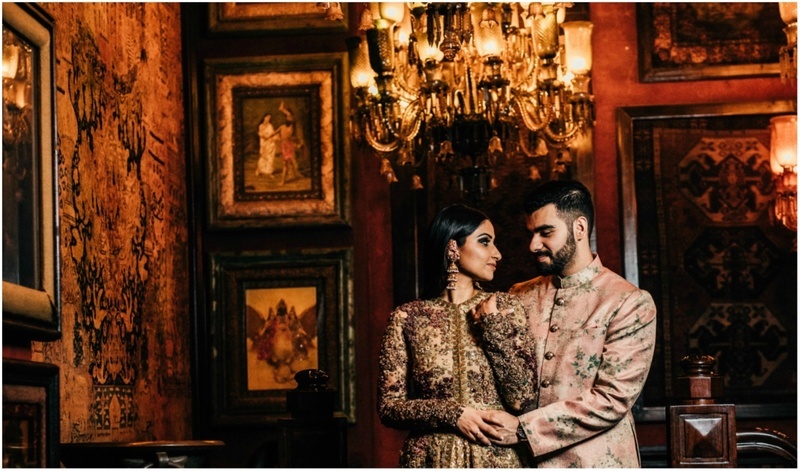 This Couple Had A Pre Wedding Shoot In Sabyasachi’s Mumbai Flagship Store And It’s Simply WoW! Couples are increasingly thinking outside of the box when it comes to their pre-wedding photos and want something unique to fit their personalities as a couple. We came across a unique pre-wedding photoshoot of this couple and it’s simply wow. Ankita and Karan just got engaged and unlike a lot of couples who have a pre-wedding shoot, they had a pre-engagement shoot. What makes their photo shoot unique is that they had it done inside Sabyasachi’s flagship store. Yes, you heard it right, inside the master courtier’s flagship store in Mumbai. Ankita is a designer herself, who after graduating from NIFT, Gandhinagar and now owns a brand - Nimamsa. Like most of the million Indian brides who are mesmerized by Sabyasachi bridal collections, Ankita was obsessed with the beautiful creations too. She knew in her heart was going to be a Sabyasachi bride for her engagement and all that was holding her back was actually going to the store and picking out the attire. On the day she went to pick up her garment from the store, she was taken aback with the whole vintage vibe of it. She loved the interiors so much that she decided to do a photoshoot with her to-be fiance right there. Now, you can only imagine what a shoot inside a Sabyasachi store would look like. Say hello to the couple dressed in Sabyasachi from head-to-toe and posing in the rustic backdrop of Indian calendar art prints, Tanjore paintings, retouched studio portraits, Portuguese tiles and Indian print wallpaper. Dream Diaries have captured their romantic moments beautifully in the dimly-lit corridors of the store with the whole old calcutta vibe to it. We are in love with this stunning photoshoot where the couple looks breathtakingly stunning against the mesmerizing backdrop of heritage art and paintings on display along with the vintage Dutch plates, photographs, and sky-high chandeliers. We are in awe of this splendid job done by Dream Diaries of firstly being able to capture these stunning photographs in such dimly lit backdrop. Secondly, we really admire how this shoot was completed in 40 minutes. Yes, you heard it right the shoot was wrapped up in 40 minutes. Location - Sabyasachi Mumbai Flagship Store.